Elkan celebrated his 11th birthday 4 days ago. I got 2 nice birthday gifts for Elkan but they were in transit from two different parts of the world. As the gifts won’t arrive on time and not disappointed him, Felicia drew a couple of clue cards and left them beside his bed. 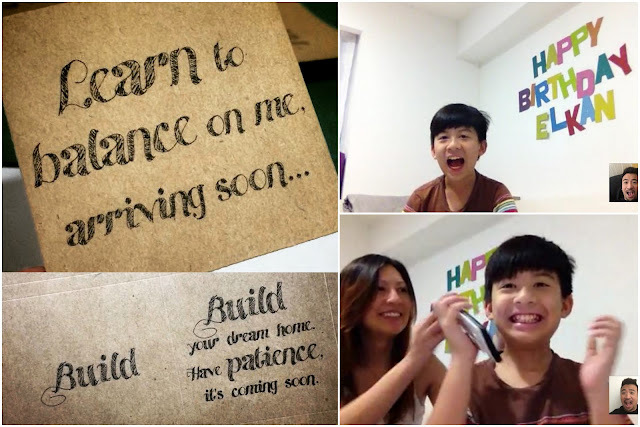 As usual, my little prankster was hyper-excited and too impatient to wait for the arrival of his gifts. Over Facetime, he kept pestering me about the gifts. I told him I will reveal one of them to him. (Of course, I didn’t reveal the real answer.) When I told him I got him a very nice skateboard, he was super happy. However, the second he saw the photograph of a pink Hello Kitty skateboard, he was dumbfounded! Yes, you know, it was the “WTH-YouGottaBeJoking” expression. What a priceless hilarious moment! I love my boy so much! And I glad he accepted the gesture prank with grace. 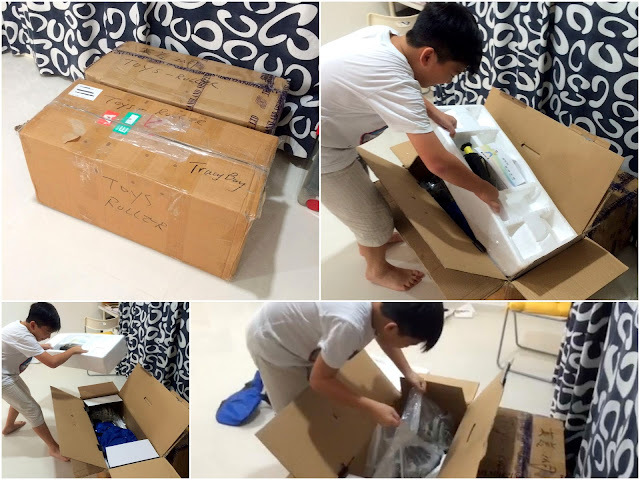 3 days later – the shipment finally arrived from Hong Kong. Elkan was so excited to unwrap his gift! 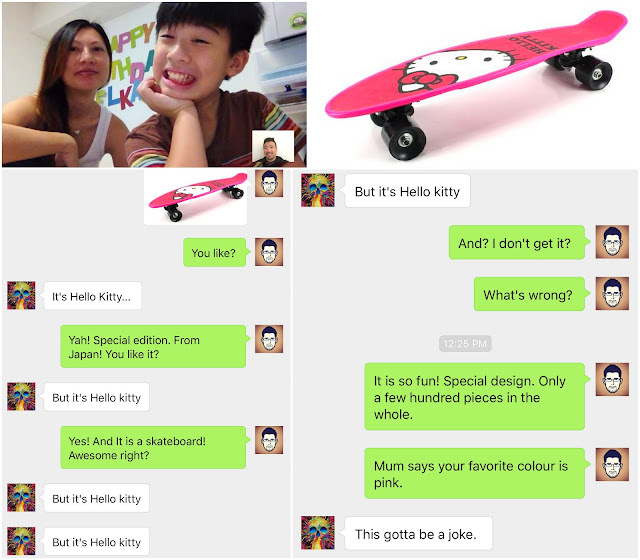 There isn’t any pink Hello Kitty skateboard. 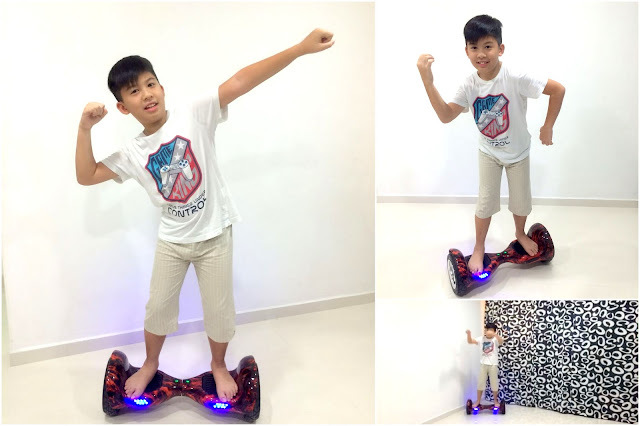 It is what he is wishing for – a mini electric 2-wheel balance-board (aka mini segway, e-cruiser, 风火轮, 電動雙輪平衡車, hoverboard, airwheels, hoverwheels, Smart wheels, phunkeeduck and 20 other names)! I was about to give Elkan a short tutorial over Facetime but he mastered the board within seconds! He is such a natural! 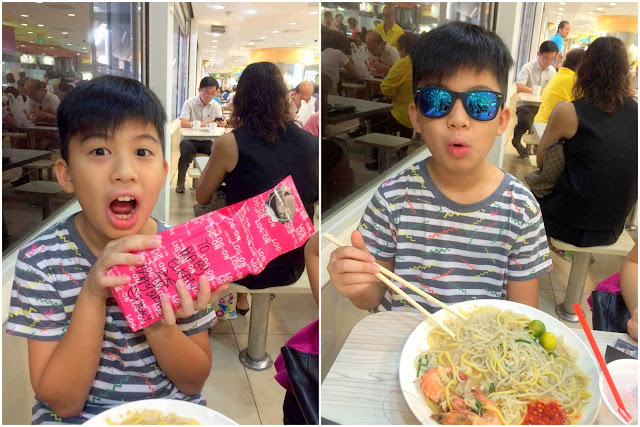 This afternoon, Auntie Bay Bay made a surprise appearance at his house with another pink-wrapped gift! 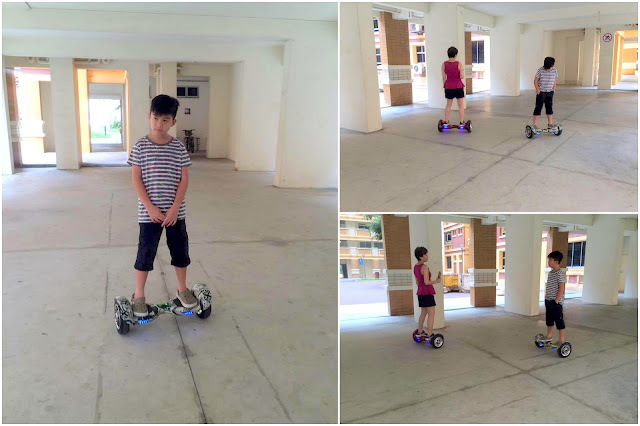 Both of them went wheeling at the void deck (the other mini Hoverwheels is a gift for my cute nephew, Didi!). Of course, they attracted lots of attention. Even Felicia gave it a try! 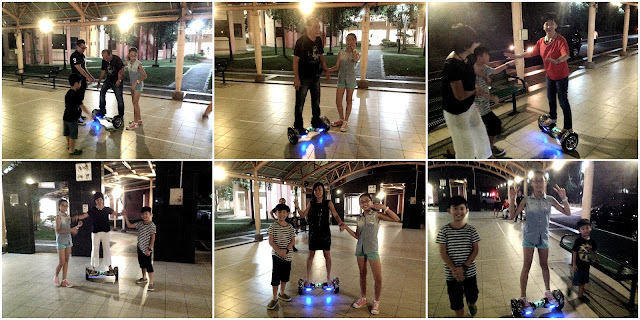 Later in the evening, Felicia and Elkan brought Didi’s hoverwheels to my mum’s birthday dinner! What a special day (Back to the Future) to get the whole family to experience the joy of hovering! After the dinner, the children and old folks tried on the wheels. I must say they were doing extremely well! Happy to see the folks at home having so much fun together! Wish I can be there with them today! Enjoy and I will see you folks very soon! wonderful, so looking forward to meeting you guys one day! That’s so funny. Happy birthday Eikan! Hahah… Thanks for the wishes. Hehehe.